It's become a rite of fall in Grand Rapids, with 400,000 visitors descending on downtown for the sixth edition of Art Prize. The $560,000 international competition crams arts entries into just about every public space imaginable. It fills hotels and restaurants, stirs lively talk about art and generates more than $20 million in economic impact. It's also a portrait of understandable civic pride in a region that continues its climb as a rising economic power in Michigan. Spurred by robust growth in manufacturing, Grand Rapids economic output grew from 10 percent of state GDP in 2001 to 11 percent in 2013, according to the most recent data from the U.S. Bureau of Economic Analysis. That's easily second largest in the state – though just over a fifth of Detroit's 52 percent share (down from 54.7 percent in 2001). 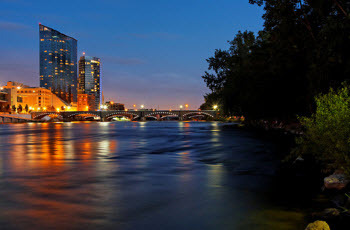 Grand Rapids is not all the way back from the recession. But it's closest of any region in Michigan. The region's GDP in 2013 stood just .4 percent below its peak year of 2005, according to BEA analysis. By comparison, the Detroit region is still 8 percent below its peak in 2005. Just about every sector in the Grand Rapids region grew in 2013. Of the major industries, only government spending was down, falling 2.9 percent. But other sectors were up. Arts and entertainment grew by 7.8 percent, real estate by 7.7 percent, information (publishing and telecommunications) by 7.7 percent and construction by 6.7 percent. Manufacturing, the region’s largest sector, gained 6.2 percent. “The economy of the Grand Rapids area has made some big strides…(and) is likely to continue to do so,” said Michigan State University economist Charles Ballard. Though he noted that Kent County income levels remain far below Oakland County, north of Detroit. While Detroit still dominates the state economy, the Grand Rapids area’s furniture industry – with such stalwarts as Steelcase, Herman Miller and Hayworth – lends the region a more diverse manufacturing base than auto-dependent Detroit. Indeed, manufacturing has climbed back up to 25 percent of the region economy, compared to 17.7 percent in Detroit. “We never gave up on manufacturing here,” said Birgit Klohs, president and CEO of The Right Place, a Grand Rapids-based regional economic organization. The West’s momentum also shows up in population trends. Wayne County, which includes Detroit and is the most populous Michigan county, lost 240,000 people in 10 years, from just over 2 million in 2000 to 1.8 million in 2010. Kent County, which includes Grand Rapids and is the most populous county in the four-county West Michigan region, grew from about 575,000 in 2000 to about 602,000 in 2010. Kent County is projected to gain another 40,000 residents residents by 2040, according to a University of Michigan study. Wayne County is projected to lose about 200,000 more by then (though even so, it would still be about 2.5 times the population of Kent). “Money follows people,” said Eric Guthrie, the State of Michigan’s demographer who is called upon to aid other state officials with population projections and analysis.